"Old MacDonald Had a Farm" is children's favorite nursery rhyme and baby song from the treasure trove of nursery rhymes. The rhyme has a Roud Folk Song Index number 745. "Old MacDonald Had a Farm" is about a farmer named MacDonald (Macdonald and McDonald) and his various farm animals that include cows, dogs, horses and more. Each verse of this popular animal song changes the name of the animal and its respective sound. For example, the first verse uses a dog as an animal and "woof" as the animal's sound. Then the second verse uses a horse as an animal and "neigh" as the animal's sound and so on. Each verse of the rhyme changes the animal's name and its respective sound. Further, the verses use different animals and their respective sounds. This version lists different species of animals such as dogs (woof woof), horses (neigh, neigh), cats (meow, meow) and pigs (oink oink). The list of English language words used to represent the sounds of particular animals are usually used by animals for communication. The lyrics to the rhyme have been translated into different languages also. The words are slightly modified to fit the rhythmic and cultural requirements. This version includes seven species of animals - hens (cluck cluck), cows (moo moo), dogs (bow-wow), ducks (quack quack), cats (meow meow), pigs (oink oink) and donkey (hee-haw). Nursery rhymes have always been a powerful source of learning and developing early literacy skills. 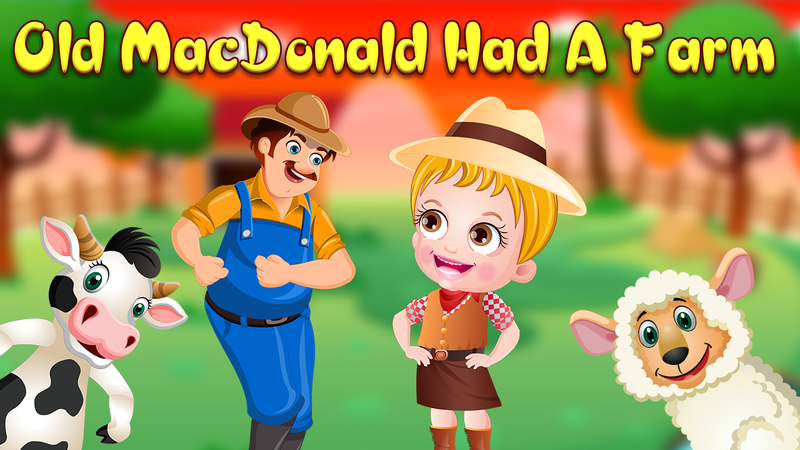 "Old MacDonald Had a Farm" nursery rhyme helps the little learners to identify various farm animals and their respective sounds. Simple and funny lyrics in the nursery rhyme add magical touch to this popular animal song and thus the preschoolers and children love and enjoy to sing it. This rhyme is an entertaining way to teach your kids about the animals and the sound they make.